FILE- Deported Somali nationals gesture as they arrive at the airport in Somalia’s capital of Mogadishu, April 9, 2014. Sixty-eight Somalis arrived in Magodishu Friday, having been deported by U.S. immigration authorities. Somalia’s U.S. ambassador says his embassy has learned that U.S. immigration agents are planning to deport about 4,000 Somali nationals now living in the United States. Since Somalia’s embassy in Washington reopened in November 2015, the ambassador said, about 170 Somali immigrants who either ran afoul of U.S. law or had their asylum applications rejected have been deported to Mogadishu, the Somali capital. Most of those previously deported had applied for but been denied political asylum in the U.S., he added. Another group of Somali applicants whose requests for asylum have been denied are now in detention centers or prisons, awaiting deportation. FILE – Somali immigrant leader Jamal Dar, right, who arrived in the U.S. two decades ago, hands out snacks to a boy at a community engagement and civic language class for former Somali residents at AYCO offices in East Portland, Ore., July 21, 2015. 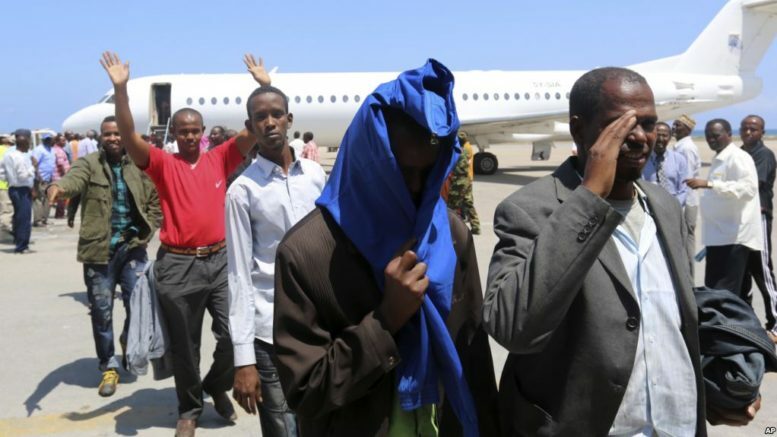 Fewer than 300 Somalis are scheduled to be moved out in the next couple of months, Awad told VOA, adding that his embassy was awaiting information from U.S. authorities on who the deportees were and when they would depart. ICE agents recently arrested 82 people from 26 nations during a five-day operation in and around the U.S. capital. According to a statement from ICE, 68 of those detained March 26-30 had previous criminal convictions, for crimes including armed robbery, larceny and drug offenses. All but three were arrested in the state of Virginia. FILE – Students walk home from school in Lewiston, Maine, Jan. 26, 2016. Since February 2000, more than 5,000 Africans have come to Lewiston; now, many Somali shops, restaurants and mosques serve the city. One of those arrested last month, Awad said, was a 50-year-old Somali man who identified himself as second in command of Somalia’s National Security Service. He had previously been deported to Somalia in 1996. U.S. immigration officials said eight of those arrested during ICE’s end-of-March roundup had no known criminal records; they either had overstayed visitor visas or ignored final orders to leave the country. Some of the Somali nationals who already have been sent back to their homeland have told VOA and media outlets in Somalia they found a different and dangerous country awaiting them in East Africa. FILE – Muslim worshippers pray inside a makeshift mosque above a convenience store and market that caters to Somalis in Fort Morgan, Colo., Jan. 8, 2016. Fort Morgan, a town of roughly 12,000 people, has about 1,200 Somali immigrants. Since Somalia has lacked a strong central government for more than a quarter-century, many Western nations have refrained from forcibly returning Somali immigrants to their home country because of safety concerns. U.S. immigration policies have been tightened considerably under the administration of President Donald Trump, and such a clemency policy for Somali nationals is no longer being observed.